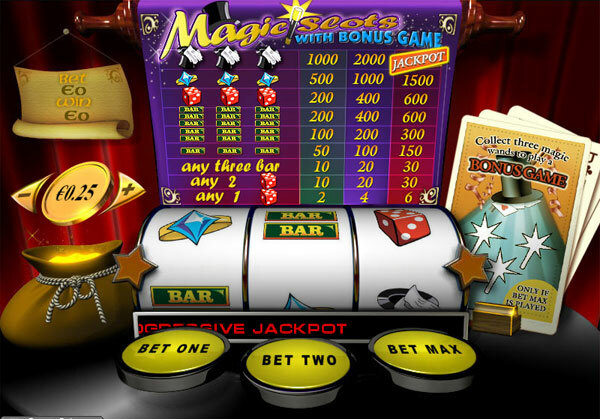 The object of Magic Slots is to obtain a winning symbol combination by spinning the reels. · Before entering the game, choose the value of the coins you wish to wager each round. You cannot change it until you exit to the lobby and start the game again. · Click Bet One, Bet Two or Bet Max (=three) to select the number of coins you wish to wager. You can also bet by clicking on the corresponding column in the wintable (the leftmost column bets one coin, the middle column bets two and the rightmost column bet three coins). The reels start to spin. · If the reels show a winning combination after they stop (along the payline), you win according to the winning table (see the top panel of the machine). Magic Slots contains a bonus game. To access the bonus game, you have to collect three magic wands, while playing for max bet. In the bonus game, select one of the four hats. You will receive a prize, depending on your selection. Magic Slots has a progressive jackpot as well. A certain percentage of every bet you make goes to the progressive jackpot pool. You win the jackpot if you get three highest rank symbols (the hat and gloves) along the payline, while playing for max bet.